Hi Crocheters! Today it’s my turn to share a brand-new exclusive pattern for the #mooglycal2018 ! 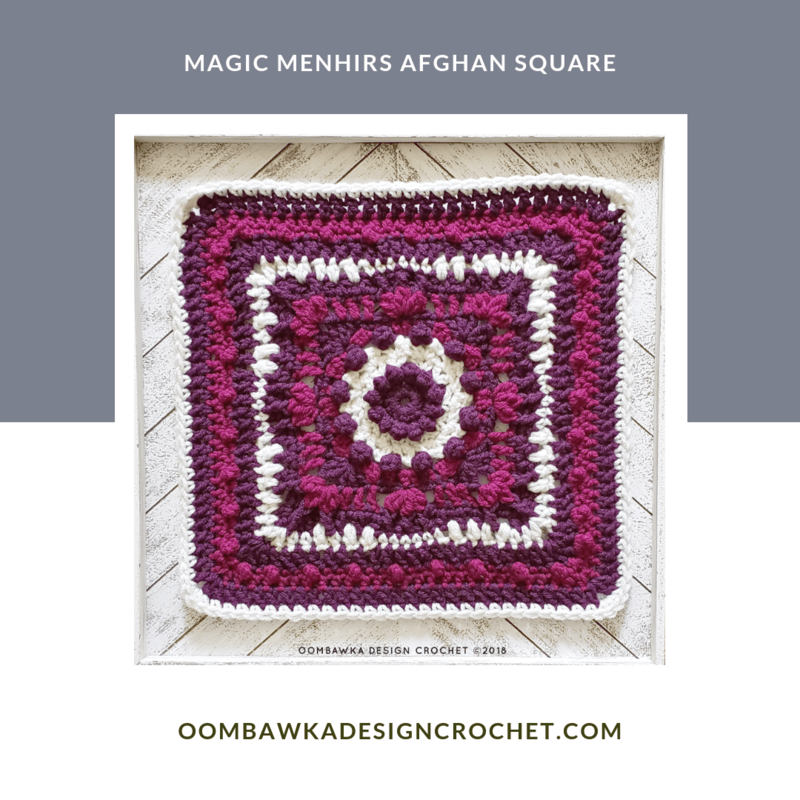 This post includes the full Magic Menhirs Afghan Square Pattern, in US Crochet Terms and as a diagram. Please feel free to use the PrintFriendly button at the very top of the post to print yourself a copy to work from, or to save a PDF copy for later. Have fun crocheting! and be sure to add your project pages on Ravelry here so I can see the beautiful squares you make too! Check out the details on the Moogly CAL page if you want to make more of the squares from this year’s CAL or previous years CALS. 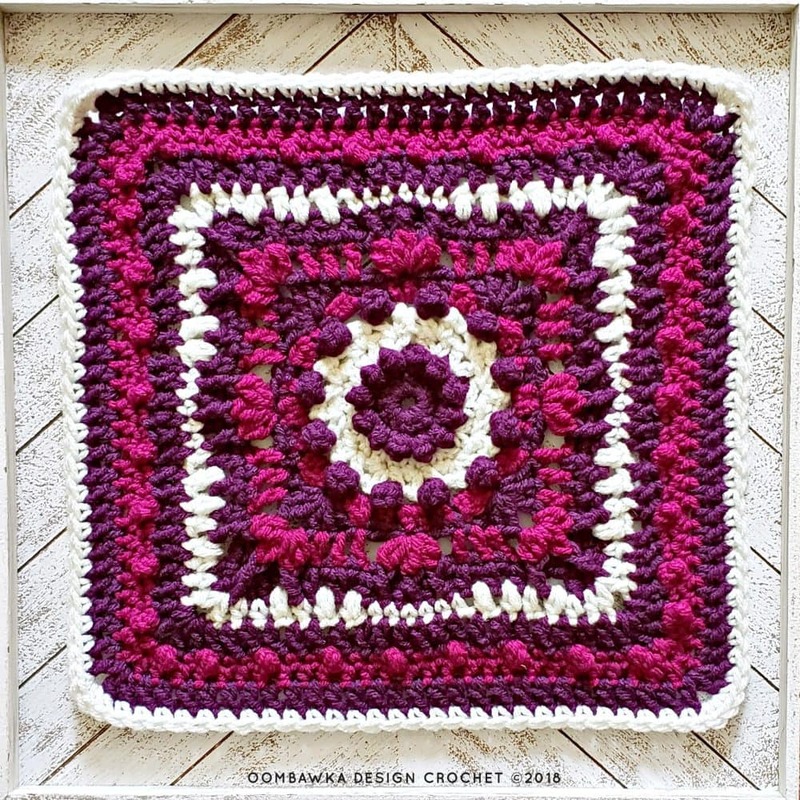 This event is a wonderful way for Crocheters to work on a project together and support each other online. Red Heart Yarns sent me the yarn and hook I used for this pattern. This post includes affiliate links. If you make a purchase after clicking on an affiliate link, I may receive a small commission for the referral at no additional expense to you. Yarn: Red Heart. With Love Yarn. 7 oz (198 g) and 370 yds (338 m). 100% Acrylic. Medium Weight Yarn . Machine wash warm, gentle cycle. Tumble dry low. Do not over dry. Do not bleach. Do not iron. Colors: 1 skein each in Boysenberry, E400_1907, Eggshell, E400_1101 and Aubergine, E400_1542. Hook: 6 mm (J). I used this hook. You can substitute any yarn and hook for this stitch pattern – just remember when you substitute if your gauge is different, the finished size, and amount of yarn used for your project will also be different. * to **– repeat the instructions between the asterisks the number of times indicated. 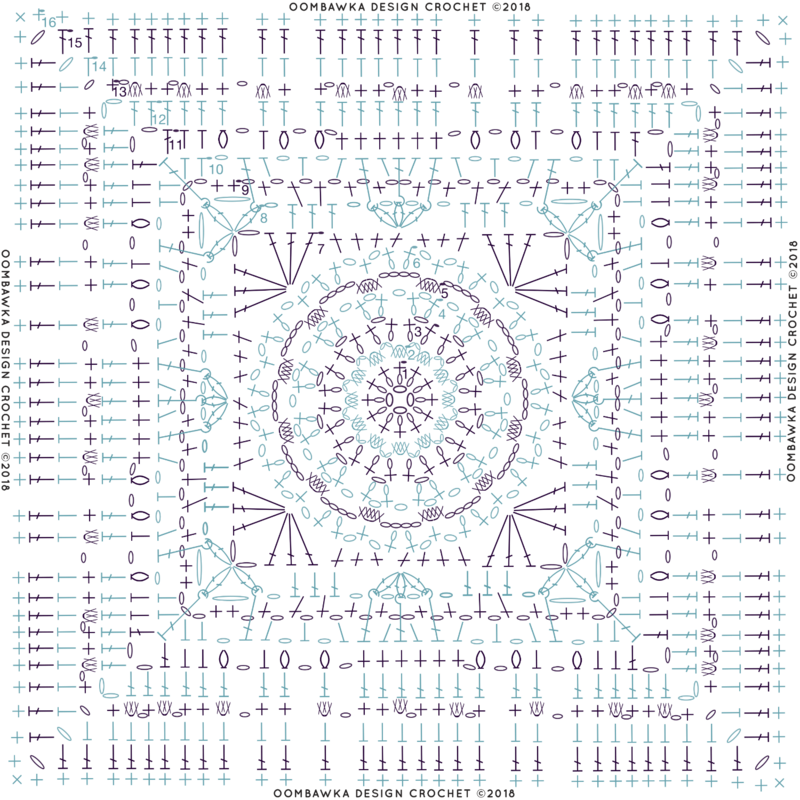 This repeat will contain of multiple instructions. 5 single crochet popcorn (5-sc pc): 5 sc in indicated st or sp, remove hook from loop, insert hook from front to back in top of first sc of group, insert hook into loop and pull through both loops. 4 single crochet popcorn (4-sc pc): 4 sc in indicated st or sp, remove hook from loop, insert hook from front to back in top of first sc of group, insert hook into loop and pull through both loops. 3 single crochet popcorn (3-sc pc): 3 sc in indicated st or sp, remove hook from loop, insert hook from front to back in top of first sc of group, insert hook into loop and pull through both loops. Double crochet 2 together cluster (dc2tog-cl): (Yarn over, insert hook in indicated st or sp, yarn over, pull up a loop, yarn over, pull through 2 loops on hook) 2 times in same st or sp, yarn over, pull through all 3 loops on hook. Half double crochet 2 together cluster (hdc2tog-cl): (Yarn over, insert hook in indicated st or sp, yarn over, pull up a loop) 2 times in same st or sp, yarn over, pull through all 5 loops on hook. 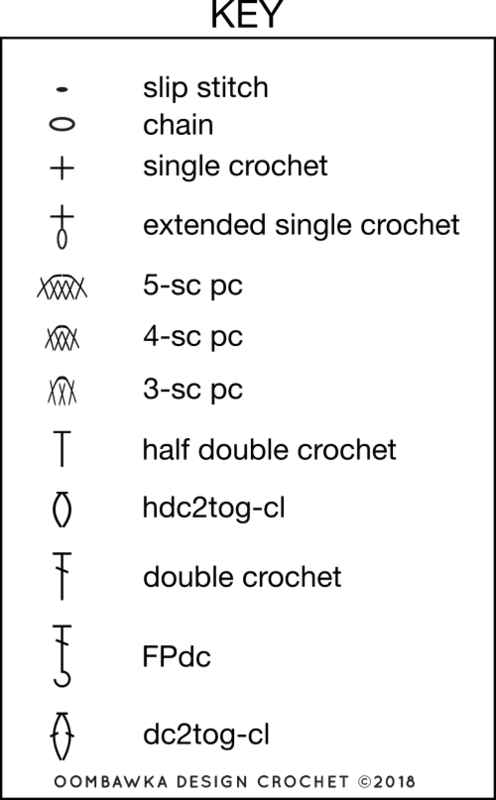 Pattern is written with a sl st join at the end of each round. I prefer to use an invisible join instead because it is tidier. Either is acceptable for this pattern up to the last round. Pattern does not have a turning chain for each round because I usually start each new round with a standing st. If you prefer a sl st join and a turning chain, feel free to substitute.